Calif. Moves Closer To Banning Vaccine 'Personal Belief' Exemptions : The Two-Way The bill would require children to be vaccinated against measles and other diseases before entering kindergarten. If it becomes law, it would be among the strictest in the nation. A photo from April shows protesters in Sacramento, Calif., rallying against a bill that would require all school-age children to be vaccinated. The state Senate just passed the measure. 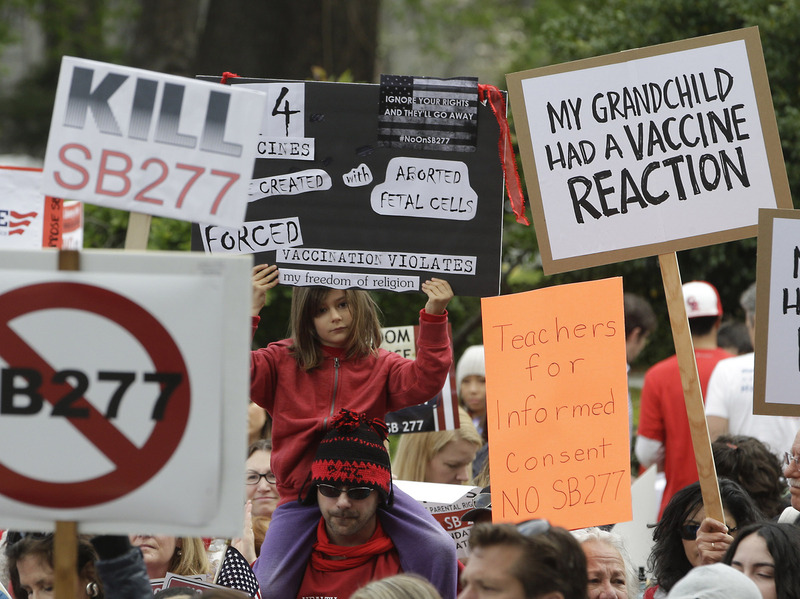 California's state Senate has passed a bill to eliminate "personal belief exemptions" that currently allow parents to opt out of having their school-age children vaccinated. SB 277, sponsored by Democratic Sens. Richard Pan of Sacramento and Ben Allen of Santa Monica, passed 25 to 10 and now advances to the Assembly. The bill's sponsors introduced the legislation following an outbreak of measles in Disneyland that started in December and sickened dozens. Most of those who became ill had never been vaccinated against measles. "When you have pockets of low vaccination," Pan, a pediatrician, said, "we need to do more to protect our communities. ... This is a matter of public safety." The San Jose Mercury News says the bill "would require children to be vaccinated before entering kindergarten. Medical exemptions are permitted but exemptions based on personal and religious objections are not." Lisa Aliferis of member station KQED in San Francisco says the vote was largely along party lines, with many Republicans opposing it. "Getting a religious exemption is not unreasonable," said Sen. Joel Anderson, R-San Diego, according to Aliferis. "Don't get caught up with zeal. ... You can gain more with honey than you can with vinegar." KQED says that if the bill becomes law, California would become the third state to have such a strict requirement. "It would mean that children not fully vaccinated against 10 specified diseases could only be home-schooled. The bill applies to all students in public, private and parochial schools." However, as the Mercury News points out: "Gov. Jerry Brown has signaled he supports the bill, but there's a possibility he might urge legislators to include a religious exemption."